NEWBURYPORT, MA (MARCH 2019) - Global Electrical Power and Advanced Materials leader Mersen is pleased to announce the launch of the Non-Indicating Class J Time Delay Fuse series. With this introduction the Class J Time Delay fuse series now offers a full range of ampere ratings between 8-600A in both indicating and non-indicating categories. The non-indicating class J offers same reliability and performance as the globally popular Mersen Class J Time Delay fuse with SmartSpot® indication to customers and applications not requiring similar fuses with indication. Mersen’s new non-indicating Class J Time Delay fuse series satisfies the National Electrical Code® requirements for use in Class I Division 2 hazardous locations. Another key benefit of the Mersen Non-Indicating Class J Time Delay Fuse series is that they possess the same size, mounting terminals, and ratings as the Mersen SmartSpot Class J Fuses. The UL/CSA Listed Mersen Non-Indicating Class J Time Delay Fuse series is readily identifiable by suffixing the letter “N” to the Catalog Number of the equivalent Mersen SmartSpot Class J Time Delay Fuse and is available immediately. 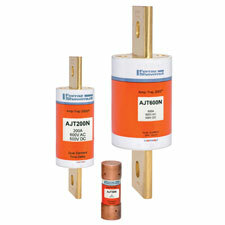 For more information about the Mersen Non-Indicating Class J-TD Fuse product offering, please visit the AJT product page. For more information about Mersen Electrical Power, visit ep.mersen.com.